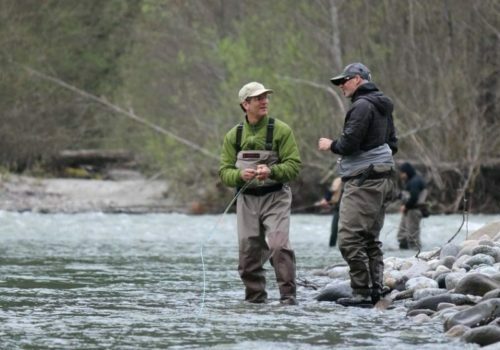 We’re pleased to offer the premier guided fly fishing in Vancouver, British Columbia. 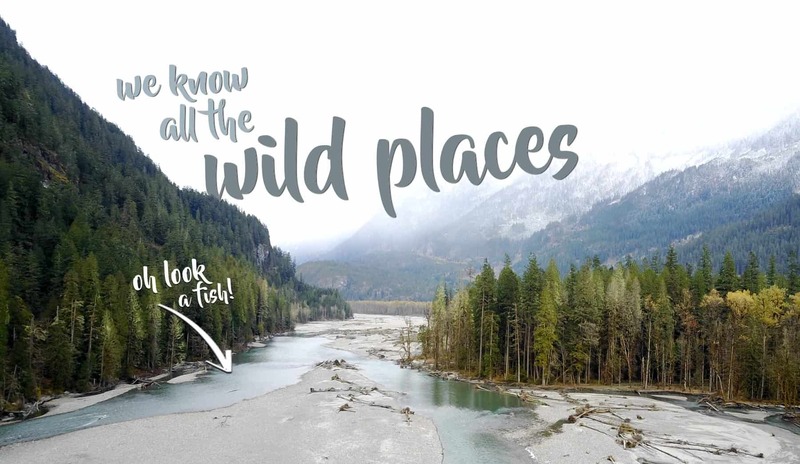 Come explore wild rivers less than an hour from Vancouver for trout, salmon and steelhead with nearly year-round fishing opportunities. Our professional guide staff will pick you up right from your hotel and have everything ready for your day with us. We guide on a beautiful river system, that offers excellent conditions for those new to the sport and challenges for the experienced fly angler. These are real deal trips, giving you the ultimate backcountry flyfishing adventure within easy reach of the city. We focus the majority of our guided trips on the Squamish River system, about an hour north of Vancouver. 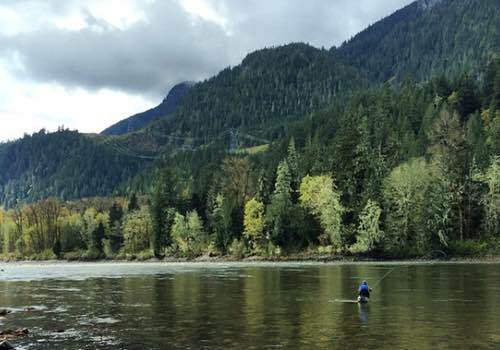 The unique and beautiful coastal rivers that make up this system offer nearly year-round fly-fishing opportunities for salmon, trout and steelhead. We’ll pick you up in Vancouver and follow the Sea to Sky highway, once in the Squamish Valley we get the waders on, string the rods and we’re off for the day. We do a mix of walk-n-wade trips an use framed rafts to drift, depending on river conditions. On a clear day you’ll be surrounded by snow-capped peaks and have the pure waters of our coastal rivers flowing beneath you. Wading is relatively easy and depending on conditions and agility you can expect to fish a variety of river stretches in a day. Obviously we don’t have control over what the fish, but we will put you in all the right spots. We control all the other factors though, so expect great service, friendly knowledgeable guides, top of the line equipment and an experience built to suit you and your group. Our trips are eight hours, often they go a little longer than that, so expect to be back in Vancouver between 4.00 PM. We service all the downtown hotels and can make easily make special pickup/dropoff arrangements. Our fully guided Vancouver fly fishing trips include everything you need for a great day on the water. We’ll pick you up in Vancouver and have everything ready for your day of fly fishing with us! If you’re not bringing your own gear, we have premium quality Simms wading gear and all fly fishing equipment available for a small rental charge of $39 CAD per person. Not included are fishing licenses, taxes and food. Price per person in Canadian Dollars. If you’re looking at a fly fishing trip with us in 2019 we’re gearing up for another busy fun year and are looking forward to welcoming new and returning clients for our 12th year of operation! 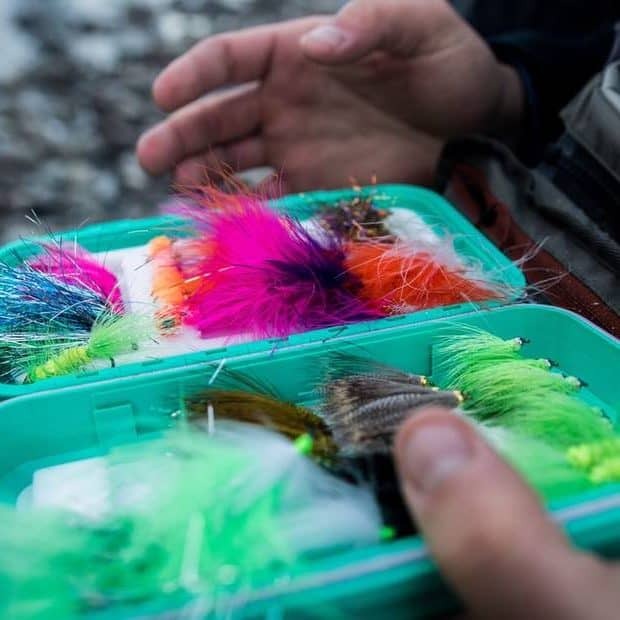 We’ll expect our 2019 season to kick off in early February, with trout fishing on local rivers and the first push of Spring steelhead on the Squamish River. With a milder winter forecasted this should give us a nice slow Spring run off with fishing into May on local rivers. 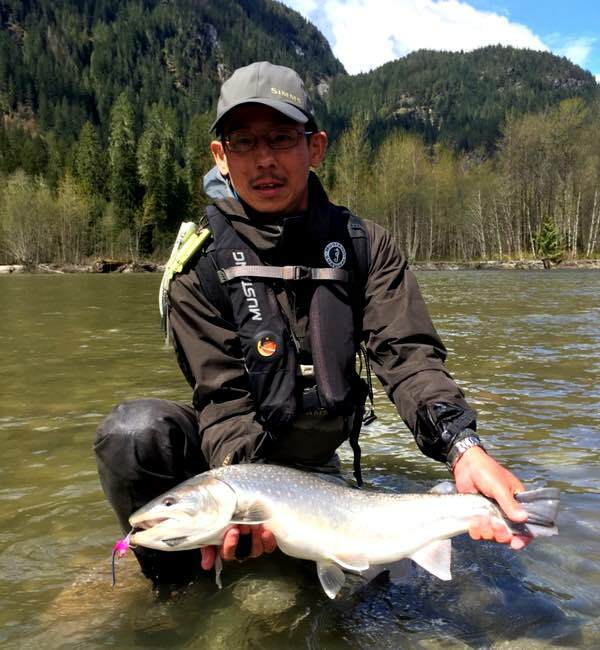 The spring months of March and April are prime time for our steelhead & bull trout season, a beautiful time to be fishing on BC’s southern coast. We expect our usually high water in May and June, and will be running our Beach Fly Fishing Trips during that time. 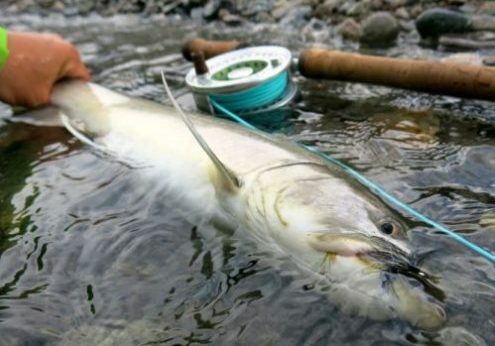 Summer 2019 is a Pink Salmon year, which is will ensure awesome fishing for salmon starting in July! This only happens on odd years, so if you’re fishing with us this Summer your timing is great. Pink Salmon fishing on the Squamish River is a pile of fun and we’re expecting good returns of fish this season. 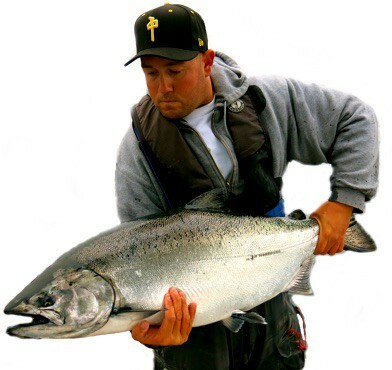 Our Fall salmon fishing season targeting chum and coho salmon will kick off in early October. We are expecting healthy salmon returns for our Fall season. If you’d like to fish with us in 2019 we’d love to have you. Our business is built on great service, honest advice and a crew of the best fly fishing guides in Vancouver. Head to our contact page to send us an inquiry. 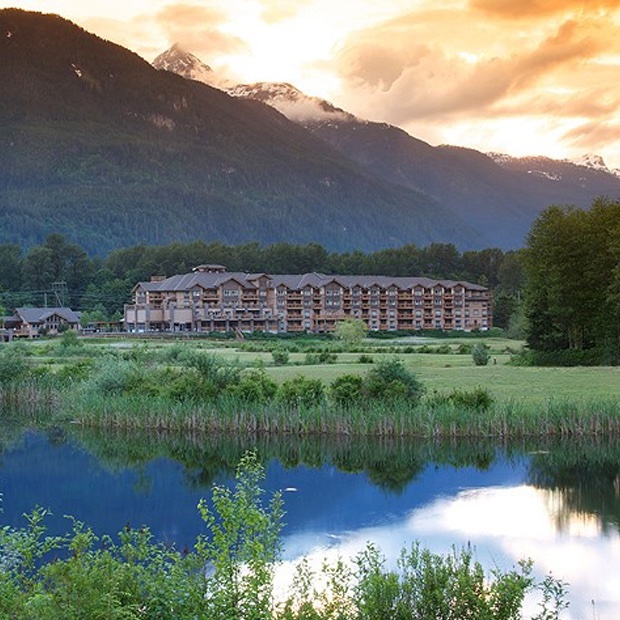 Getaway from it all with our Vancouver fly fishing packages. 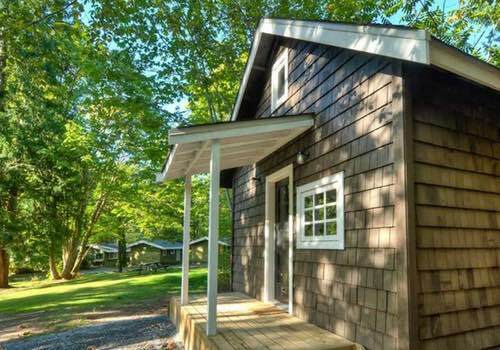 These affordable packages include transportation from Vancouver, days of guided fishing, nice hotel accommodations close to the river and lunches. Packages are flexible, we can even pick you up at the airport. 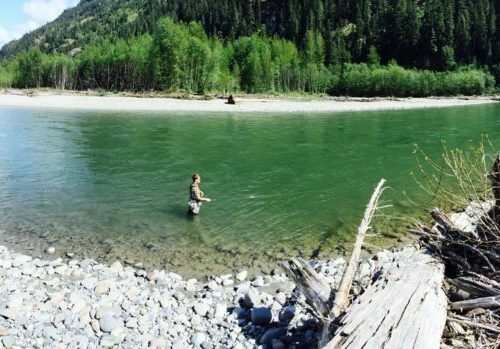 A great option for a fly fishing trip in BC that won’t break the bank! 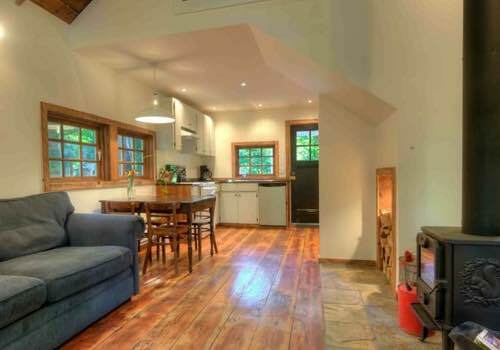 Price per person based on double occupancy but we have packages for solo anglers as well. Our hassle free Vancouver fly fishing packages include guided fishing, accommodations in Squamish BC and transportation from Vancouver. We’ll pick you up at your hotel or can easily arrange an airport pickup. 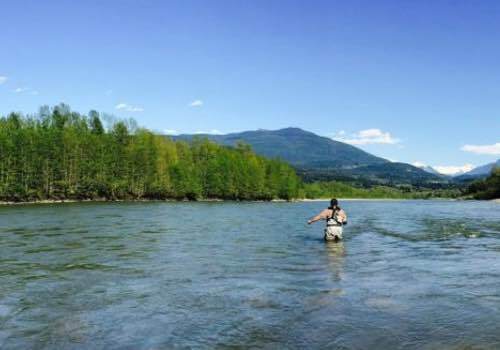 Packages are easy to plan and priced to be BC’s most affordable fly fishing getaway. You save with no big travel plans, or domestic flights, just come and have some fun with us on our home waters of the Squamish River valley! 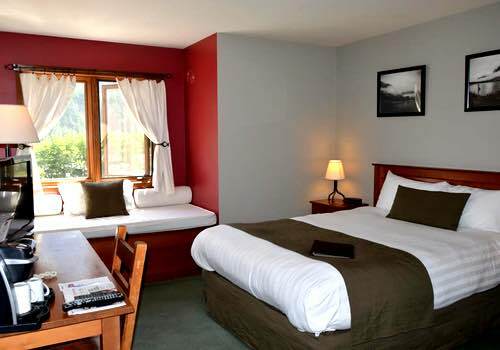 We use a few select accommodations options in Squamish for our fly fishing packages, including the Howe Sound Inn, Sunwolf Cabins and the Executive Suites & Resort. Depending on your dates and group size, we’ll pick the best accommodation for you and all have onsite dining options for your evening meals. 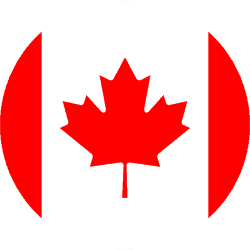 Packages are flexible, we can accommodate your travel plans and also arrange for a hotel stay in Vancouver if needed. 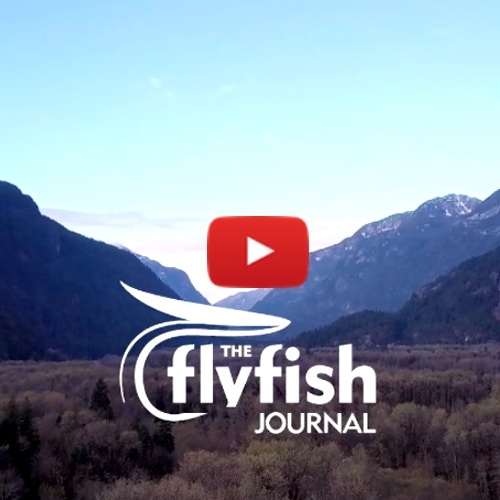 A great trip for anyone looking for an easy fly fishing getaway in British Columbia. For more info and availability use our contact page and we’ll get back to you right away. Quality is paramount to our program. 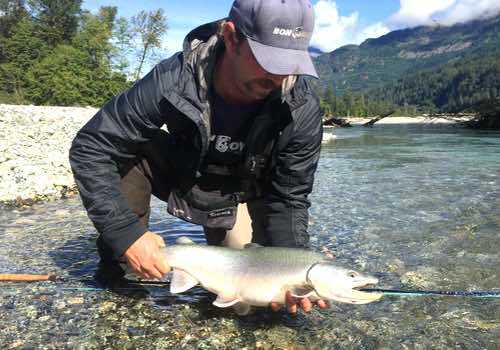 We like doing things the right way and have invested heavily in our guides and equipment to ensure you have a first class Vancouver fly fishing trip with us. We don’t cut corners and this makes for a more enjoyable and safer experience for our guests. 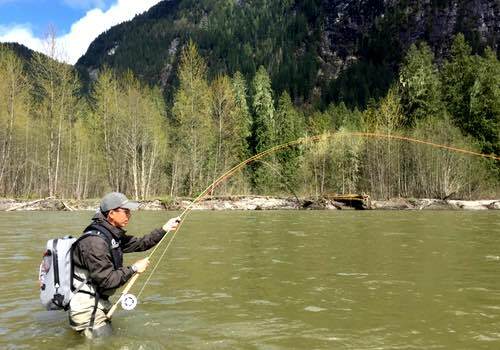 Our Vancouver fly fishing guide staff is the most experienced in the areas, most of us have been fishing the rivers we guide on for 20+ years. 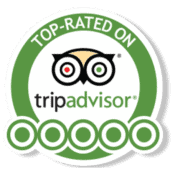 Having this crew and being dedicated to service and making sure clients like you have an amazing trip has earned us top-rated reviews on Trip Advisor with a Certificate of Excellence in 2017 & 2018. 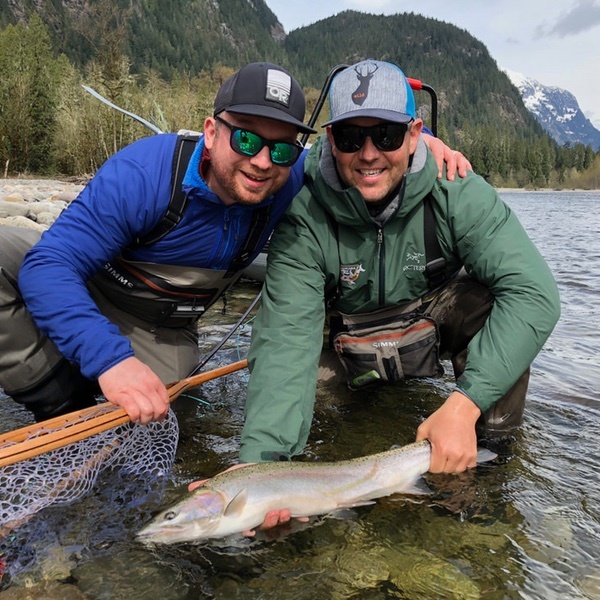 If you’re shopping around make sure you’re fishing with full-time guides who are out on the water all season, that’s what our guys are doing all year long, there’s not an operation that can boast the type of Vancouver fly fishing experience we can! You can also expect to be comfortable, from new guide trucks, to top of the line waders, rods and reels, to hand-tied flies to framed rafts for unparalleled access, Chromer Sport Fishing prides our program on quality experienced and dedicated service. 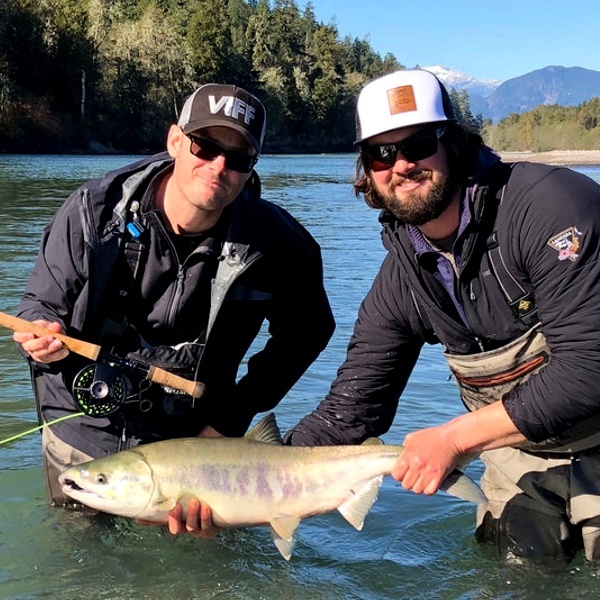 Our Vancouver fly fishing trips during the Summer months in 2019 will be focused on the Pink Salmon run of the Squamish River. This is an excellent fishery, with huge returns of fish every second year, so if you’re fishing with us this Summer you’re in luck! Mid May to late June is when see our highest river levels of the year due to the snow melt. Options are somewhat limited this time of year, but we do have our Vancouver Saltwater Beach Fly Fishing Program at that time. There are also some smaller creeks that offer trout fishing in the early Summer months. 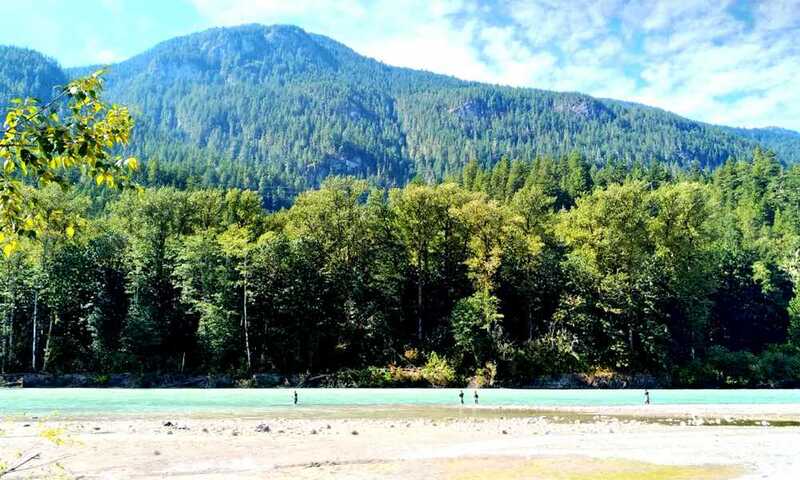 The Cheakamus, Mamquam and Ashlu rivers are tributaries of the Squamish River system and tend to stay in shape better during the Summer, offering a variety of trout fishing. Prime Pink Salmon fishing is late July through mid September. 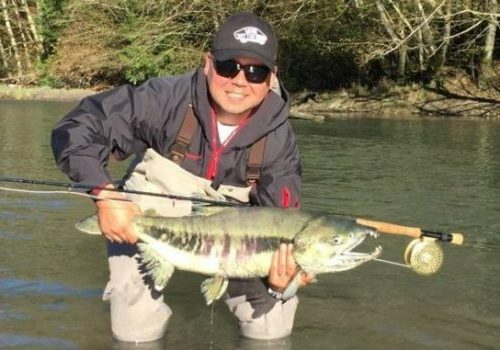 The Fall months are an exciting time for fly fishing near Vancouver. 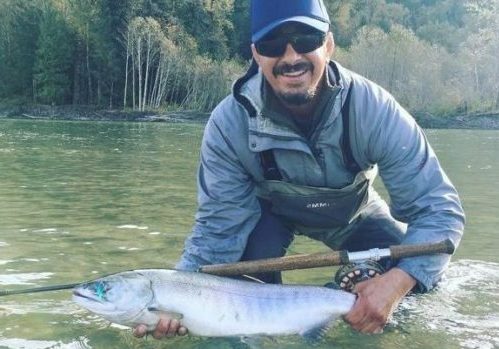 This is when you can swing flies for big migrating salmon as they return from the saltwater into the rivers of BC’s south coast. This is a super busy time of year for us and a good idea to look ahead and plan your trip early to avoid disappointment. 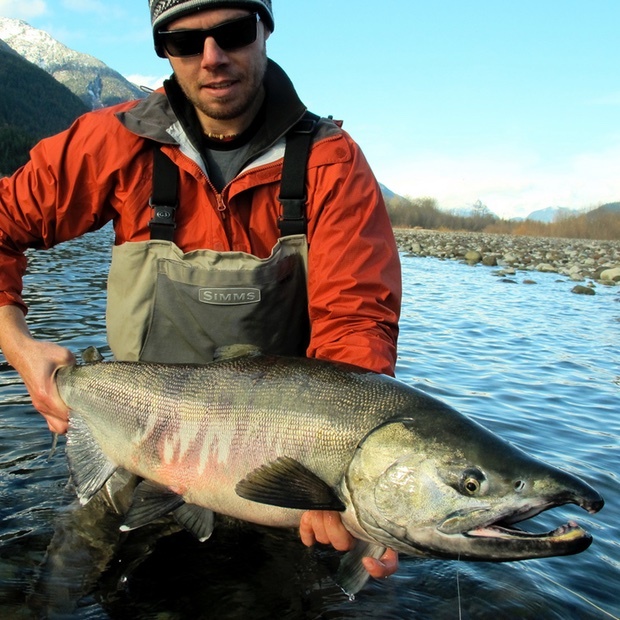 Generally the best fly fishing for chum and coho salmon is mid October to late November. We can also trout fish for resident bull trout and rainbows during this time. 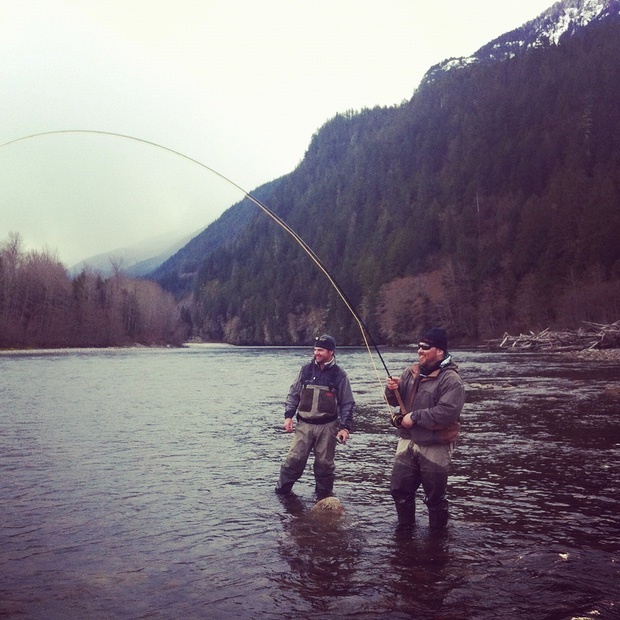 Winter fly fishing in Vancouver certainly comes with its challenges, but also its rewards. The challenge most often than not is the weather, Winter temperatures in December and January are at their coldest of the year and we sometimes have snow on the ground. For those willing to brave the cold (and the wet) they can be rewarded with rivers void of people and hungry trout, especially in December as they gorge on the remnants of the Fall salmon runs. Starting in February we start seeing the first steelhead roll into the lower Squamish River and some of the smaller tributaries including the Cheakamus River. By early March the warming temperatures tend to make for idilic river conditions as some of the low laying snowpack begins to melt. 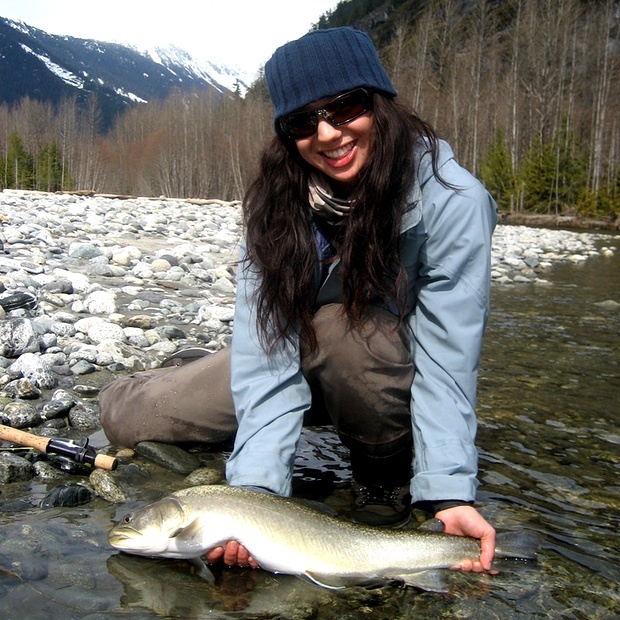 April is our prime Spring month for our Vancouver fly fishing trips. River conditions are usually excellent, with coastal rivers in ideal shape. The majority of the steelhead have moved in and we’ll put you in all the right places to optimize your chances at these stunning wild fish. We spend the majority of our time on the upper Squamish River in April, accessing the river by walk-n-wade and raft drifts. This is a beautiful area, about 90 minutes north of Vancouver, where elk, mountain goats and other wildlife roams free.